Alumni, friends, current and former employees look back at the moments that mattered. It has been a fixture on the George Washington University campus since 1975, anchoring a tract of land bordered by 22nd, G and F streets NW. 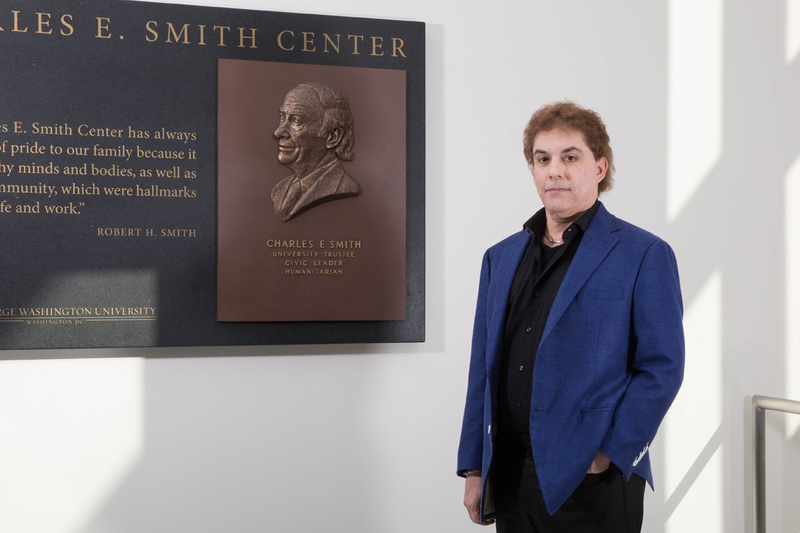 The Charles E. Smith Center has witnessed breathtaking moments in the four decades since its opening—hosting presidents, musicians and comedians, tournaments and career fairs, current and prospective students. Bob Dylan performed there, so did Ray Charles, the Beach Boys and the Black-Eyed Peas. Bob Hope, Jon Stewart, Whoopi Goldberg, Robin Williams—they all delivered punch lines there to sold-out crowds. Joe Biden packed kits for military service personnel. There was even an early 40th birthday present, delivered last month when the men’s basketball team beat No. 6 Virginia—the program’s biggest upset win at the Smith Center in 20 years. It was dedicated Dec. 6, 1975, prior to a men’s basketball game vs. Wake Forest. Gerald Ford was president of the United States, and One Flew Over the Cuckoo’s Nest was the nation’s top-grossing film. Washington’s first Metrorail stations were four months away from opening. The Smith Center, which underwent a massive renovation from 2008-2011, always has been about more than sports and famous names. 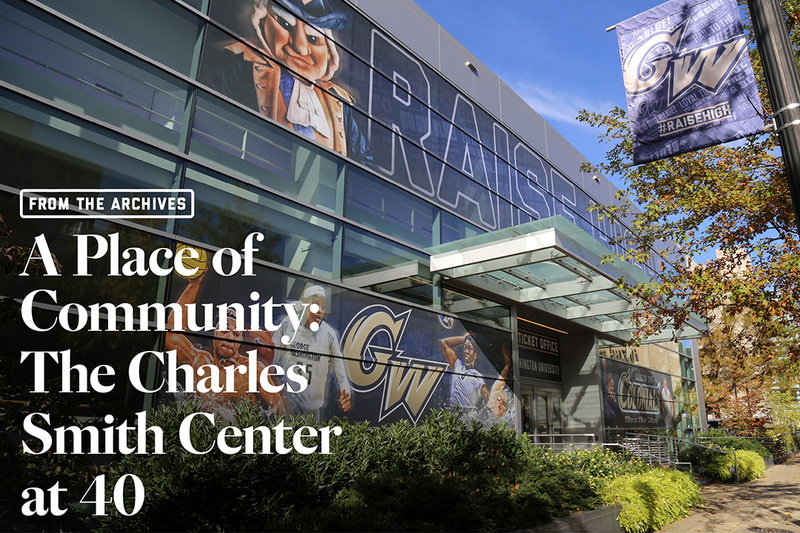 It has served as a home base for the GW community—a place of history, entertainment and celebration. 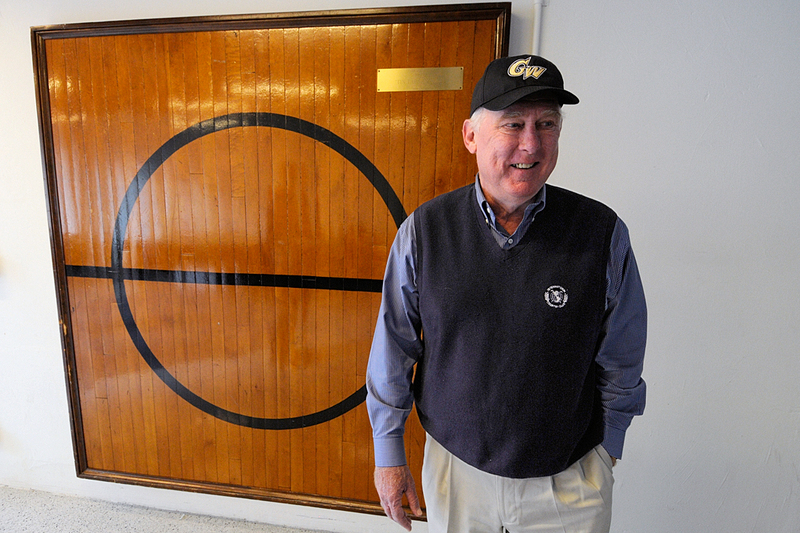 The GW Athletic Hall of Famer set six school records during his one season as a player in Foggy Bottom, then returned to campus in 1970 as an assistant coach. At age 28, he became one of the youngest head coaches in the nation. The Smith Center opened that winter. "Before the Smith Center, we practiced at the Tin Tabernacle on the University Yard. The walls were the out-of-bounds markers, you couldn't stand on the sideline. It was regulation-size, I think. I left a lot of sweat and blood on that floor. During the summer, after I started coaching here, I would open it up, and everybody in the city would come down here and play—Adrian Dantley, Dave Bing, all those guys. It had a tin roof, baby—it would be 110 degrees in there. "On Fridays during the season, we always practiced early. 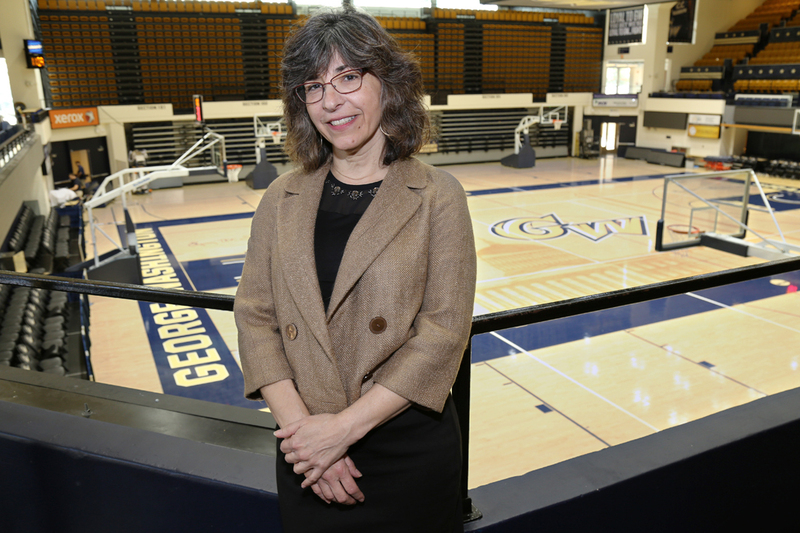 And I had to come over and run out all the law students—GW students would use it to play pickup games. Mark Warner, after he became governor, I saw him in Richmond, and he said, ‘Coach Tallent, you remember kicking us out of the gym?' And I said, ‘I do, but if I'd known you were going to be governor, I wouldn't have done it.'" The author of 11 books, including one on his grandfather, Mr. Smith visited GW as a prospective student during the era of the Tin Tabernacle. His undergraduate career coincided with the opening of the Smith Center. The building symbolizes one of the hallmarks of his grandfather's life—the connection of mind and body—and is a reflection of both his grandfather and father. "My grandfather knew that the mind and body were connected before most people were aware of that. From the time he was maybe 23 or 24, in 1925, until the day he died when he was 94 and-a-half, he had an exercise regimen every morning. I mean, it was a pretty rigorous regimen. And he wanted to make other people aware of the mind-body connection. "The building was reopened in January of 2011. My father had already passed away, but I knew that it was very important to him that this building, which is on a significant corner, be the signature building of the school. And when I look around, I can see my grandfather's stamp is on the inside, my father's stamp is on the outside. Landscaping was paramount to [my father]. To him, there was no point in having a grand building if you didn't landscape it. It's pretty impressive in the spring and the summer. Layered, like their thinking." He literally had the keys to the building. Mr. Winkler enrolled as a freshman the year the Smith Center opened and was a student manager for men's basketball from 1975-79. He has spent at least one day in the Smith Center in every year since it was built. "The court back then was rubber, not wood. Less maintenance for facilities, more maintenance for the knees. 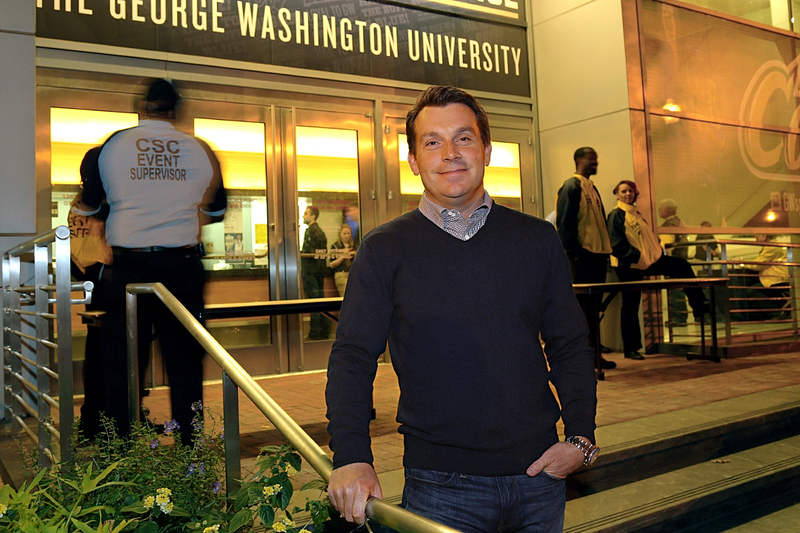 My father was a professor at GW and encouraged me to go to GW because of the tuition benefit. I had managed basketball at W.T. Woodson High School in Fairfax for Coach Red Jenkins. Red said he had a GW affiliation and asked if I would like to talk to Bob Tallent about managing for him. So, I met with Coach Tallent, and there was scholarship money there. He had two managers and one scholarship, and he said he was going to split it. So, between that and the tuition benefit my father had, I had a four-year full ride. What a great deal." Ms. Harwood's family legacy—in the form of her father's signature—is written onto the Smith Center floor for all to see. The late Mr. Silverman was scouted as a high school student in the 1940s by Red Auerbach, B.S. '40, M.A. '41, sparking a six-decade friendship. 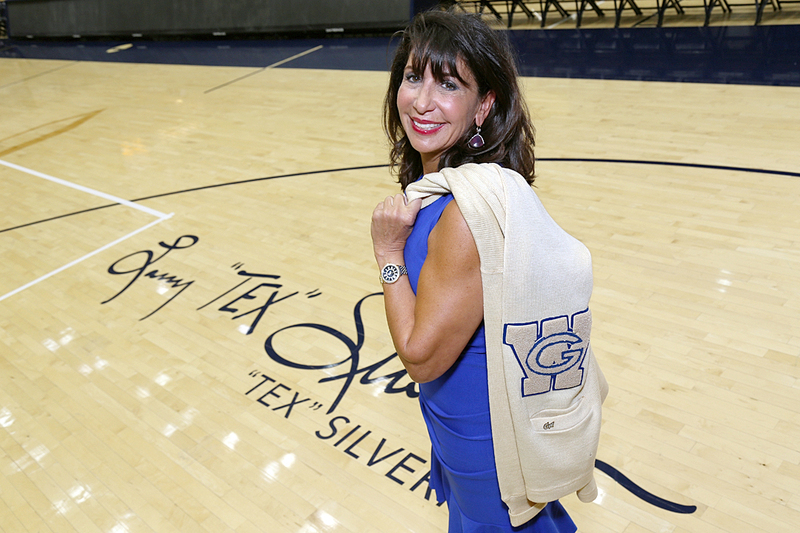 The Silverman family sat one row behind Mr. Auerbach at GW home games for years—Section 103, rows F and G.
"Seeing dad's name on the court, it just makes me feel really close to him, like we're still together. We did a lot of stuff together, and a lot of it revolved around sports. You don't ever want to forget him. Not just his basketball career or his business success, which came from getting a scholarship to play basketball here—I mean my dad would never have gone to college if it wasn't for a basketball scholarship. He got offers from Purdue, William & Mary and here. And his older brother said, 'You have to go to Washington, D.C., because there are so many opportunities for you there.'" 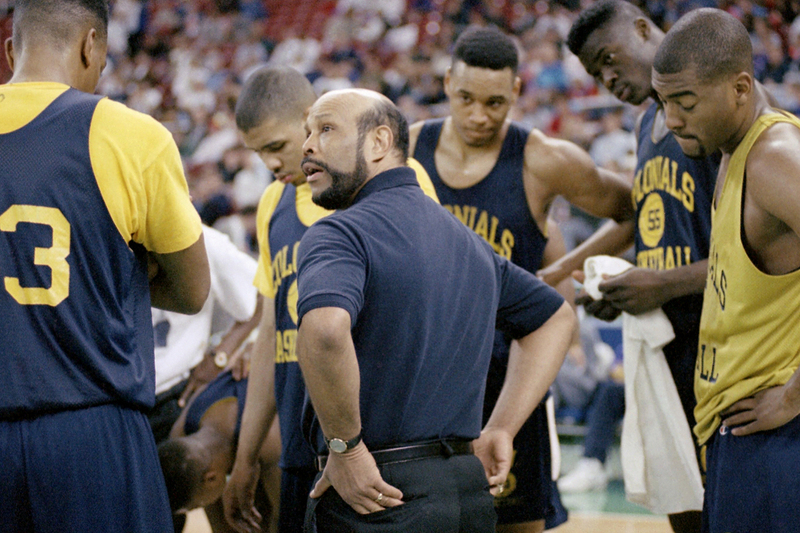 He led the Colonials to the biggest win in the history of the Smith Center on Feb. 4, 1995, a 78-75 victory over No. 1 Massachusetts—with President Bill Clinton and daughter Chelsea in attendance. Mr. Jarvis took the Colonials to four NCAA tournaments on the strength of an 82-17 record at home. "The Smith Center wasn't a place opposing coaches liked to come in and play. The fans not only packed the place, but they sat right on top of you. And they got on you from the time you came out of the locker room until the end of the game. 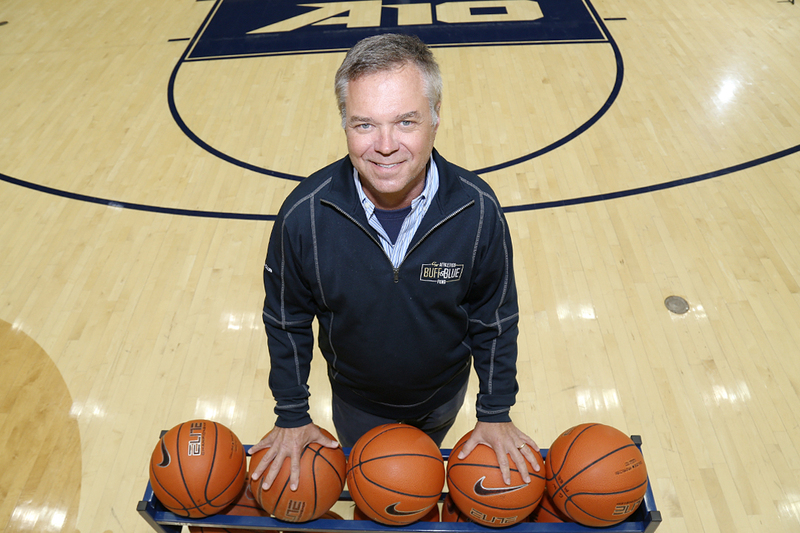 The year GW won one basketball game in 1988-89, it happened to be against John Calipari's UMass team, and someone told me he took his jacket off and threw it at the fans in the stands." Mr. Lazarus has a knack for being in the building when magic happens. He saw John Calipari throw his jacket. And he was at the Smith Center six years later when the Colonials beat UMass. When GW Today interviewed him on Nov. 16, he was in town from New Jersey for the Virginia game. "There's nothing better than storming the court," he said, hinting at the victory to come. "And that's why I'm here tonight." "We used to play intramural basketball in the Smith Center. We would play until 1 a.m., and sometimes I played with the guys on the team in pickup games. There was nothing more fun than playing on your college court. I graduated in 1991, and then we were very good with Jarvis. We made the Sweet 16 in 1993 and lost to the Fab Five. I was friends with a bunch of the kids on that GW team. "I still come down to games today. I take the train. We've been coming down here every year, sons and dads. We make a whole weekend out of it. It's tradition." 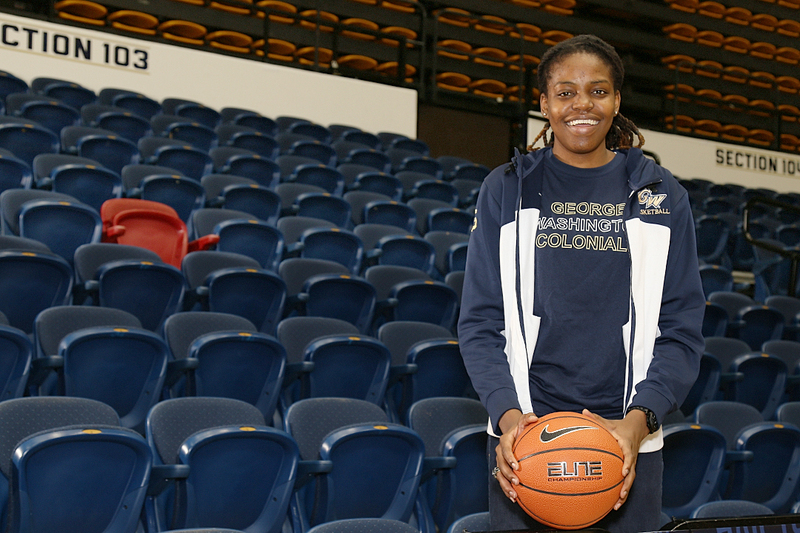 The reigning Atlantic 10 player of the year has helped lead a renaissance for GW women's basketball, which won a program-record 29 games last season. On March 1, the Colonials clinched the 2014-15 conference regular season championship. Two weeks later, they celebrated an NCAA berth with a pep rally in the building. "It was my first NCAA tournament and my first selection show. We knew we were in, but you're still waiting to hear your name called and waiting to see where you're going to go play, who you're going to be playing. It's that excitement, mixed with that nervousness and waiting to hear [the news]. We were one of the last teams announced. It was just an awesome experience to share with everybody." 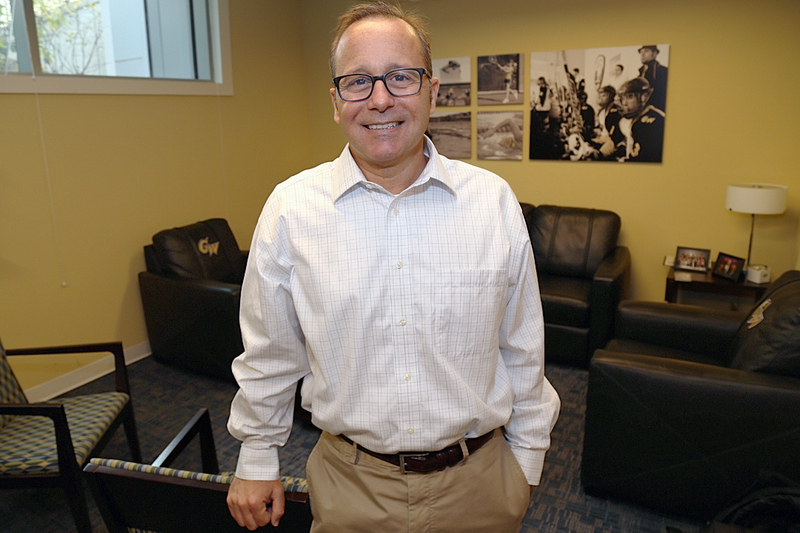 He has taken many steps to visually connect GW's largest indoor space with the city—most notably the 2013 unveiling of a National Mall motif on the court. More than anything, he said, the Smith Center is a place of people. "One of the first memories our students have of coming to college is Freshman Day of Service and Convocation. And then, for many of our students, one of the last memories is their Commencement ceremony. That's why it was so important for us to put the National Mall on our basketball court. Anytime they are back in the building or watching on television, and they see those monuments on our court, it brings them back to those memories." 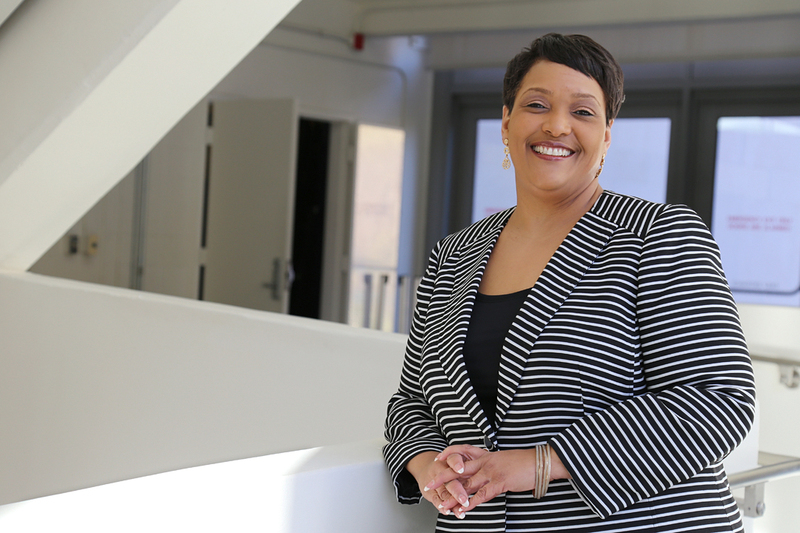 Her office hosts one of the largest annual events in the Smith Center, Freshman Convocation and Day of Service, which in 2015 accounted for 7,525 volunteer hours. "That day is an opportunity to bring the whole community together, to think about and talk about our shared values, our shared vision for our community. It's often the first time the freshman class sees itself together, and the speakers leave students thoughtful and even a bit reflective as they go out to serve. You can feel that willingness to collaborate. The Smith Center is an essential place for that to occur—it's part of our athletics life, it's part of our community life and it's part of our academic life." Every spring, the university hosts Inside GW, giving admitted students an opportunity to get a look at life in Foggy Bottom. There is a palpable energy on those days, Ms. Felton said. "All of our admitted students and families are along the north side of the arena. It's really a high-energy start to the day. George [the mascot] always walks me out—all the speakers stand on this raised podium. And I always feel this sense of pride when I stand and look up at all the potential new members of the GW community. College campuses, for me, represent possibility. I stand there and look up at the families and am so overwhelmed with pride as I think about the amazing four years that lay ahead for them." New fight-song themed uniform deepens the Colonials' closet. Junior forward Mackenzie Cowley overcame a midseason scoring funk to net the game winning goal in each of the Colonials’ final three games. International students fuel GW's nationally ranked squash programs.